Oppo Realme 2 went on its first sale on Tuesday and going by the statistics provided by the company, we can say that the sale went pretty well for the second smartphone launched by Oppo's new sub-brand. Oppo Realme 2 went on its first sale on Tuesday and going by the statistics provided by the company, we can say that the sale went pretty well for the second smartphone launched by Oppo's new sub-brand. Nearly two hours after the sale concluded, Realme tweeted about their success. According to the company, they managed to sell 2,00,000 units in just five minutes. 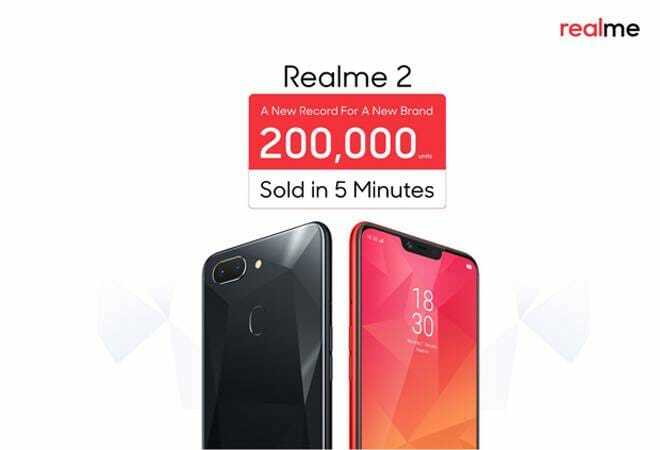 The tweet declaring Realme 2's sales read, "Realme2 has achieved a new record by selling 2 Lakh units in 5 minutes! Thank you for being ANotchAbove with us. "The next sale for the Realme2 is scheduled for September 11 at 12pm. Many buyers, on the official post of Realme 2, claimed that their orders had been cancelled even after completing the order. The company was prompt in response and promised to look into the matter. On one of the posts, Flipkart responded by saying, "your order has been cancelled as per the seller's cancellation policy." The Realme 2 is placed in the entry-level smartphone and is powered by Qualcomm Snapdragon 450. Other than the chipset, the phone mostly features qualities that belong to a segment higher. The company claims that the Realme 2 is the first smartphone to feature a notch in the price range that it is offered in. The smartphone also comes with a dual-lens camera. The back of the phone has a unique diamond cut design as well. The company claims they have used 12 layers of nanoscale composite material on the phone's body. The phone also gets a massive 4230mAh battery and face recognition, which is unheard of in this segment. On the downside, the device has a relatively low resolution for the size of the screen. It comes with a 6.2-inch display panel with an HD+ resolution. It has an aspect ratio of 19:9 which has become the norm with most smartphones with a notch. The camera comes with a 13-megapixel primary sensor and another 2-megapixel sensor. The front facing camera features an 8-megapixel sensor with Realme's AI Beauty 2.0 Selfie Technology.